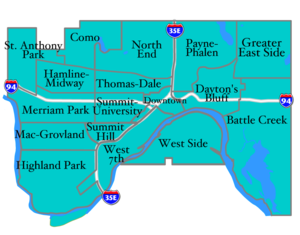 Saint Paul is the capital and the second most populous city of the U.S. state of Minnesota. Saint Paul began as a tavern started by Pierre Parrant, known as "Pig's Eye" (as he was blind in one eye), a man who sold liquor on the river flats below the current downtown area. The area around the tavern grew into a trading outpost known as Pig's Eye or Pig's Eye Landing, where Native Americans, European explorers, and American soldiers lived in close proximity. The city spans the Mississippi River, near the confluence of the Minnesota River. Later the city became a center for transportation and trading in Minnesota, as steamboats could not travel further upriver. This page was last modified on November 25, 2009, at 15:19.